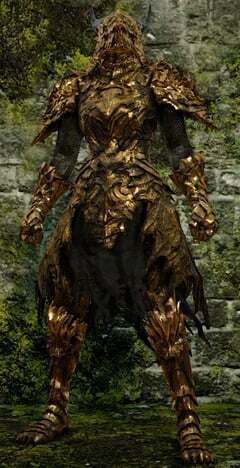 Black Dragon Set is an Attire or Armor in Dark Souls 2. ""Eerily shaped helmet/armor/gauntlets/leggings spoken of in legend, crafted with the scales of the Black Dragon. The Black Dragon was long considered a mere legend, but this proves its existence."" Achieve Rank 1 in the Dragon Remnants covenant to obtain the Dragon Head Stone for the helmet. Achieve Rank 2 in the Dragon Remnants covenant to obtain the Dragon Torso Stone for the rest of the set. Cannot be removed unless the wearer dies. Ring of Life Protection is recommended in this case if you want to purposefully unequip the set.